WOW! A Fantastic collaboration of 2 Masters. Jack Busfield made a beautiful knife and Steve Lindsay worked his magic with the engraving. 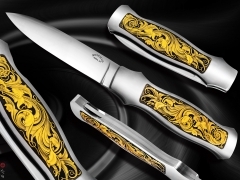 Steve did a Fantastic "All Gold" Scroll engraving on this Masterpiece.